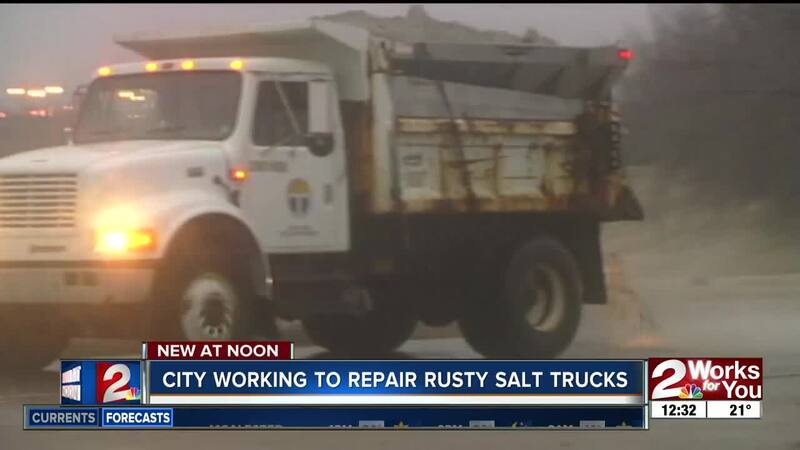 City of Tulsa crews traveled hundreds of miles in rusty trucks Thursday morning de-icing roads. TULSA — About half of Tulsa's rusty fleet of salt trucks drove hundreds of miles Thursday morning de-icing roads. Road Maintenance Manager, Tim McCorkell is hoping to upgrade the trucks sooner rather than later. He said some of the trucks are worth $110,000 but need $160,000 worth of repairs. "The last few years haven't been that bad, so these issues come from the earlier years when we had more snow and more ice," McCorkell said. The rust has caused a slew of problems for the vehicles. McCorkell said the bolts are rusting and breaking off, which makes repairs more complicated and more costly. He said rust has caused the bed that holds the salt of at least one truck to come loose. The city had to weld it back together. In some of the trucks, the floor boards have rusted to the point where they have holes in the floorboard where the driver's feet go. "We have trucks that have rust issues, but not all the trucks have that floorboard issue," McCorkell said. "They keep getting worse. If we don't get them replaced, we are going to have several trucks that are going to be like that." He said it also presents problems for drivers while they are out treating the roads. "When you're out driving in this type of weather it's kind of hard to keep your cab warm too so that's another issue the drivers are having to deal with," McCorkell said. There have been times when the trucks break down and leave the drivers on the side of icy or snow-covered roads. The damage is a result of the salt. McCorkell said they try to wash the trucks after they are used, but on cold days, car washes are not open. The salt sits on the metal and makes the problem worse. In the fall, Improve Our Tulsa will be up for renewal. Mayor G.T. Bynum announced part of that money will go toward upgrading the salt truck fleet. McCorkell hopes to get stainless steel trucks to avoid having a rust problem in the future. He said the price of trucks has gone up by about $75,000 since the city last bought any. They now cost more than $200,000. The stainless steel trucks cost even more, but McCorkell is waiting on an estimate to see just how much.